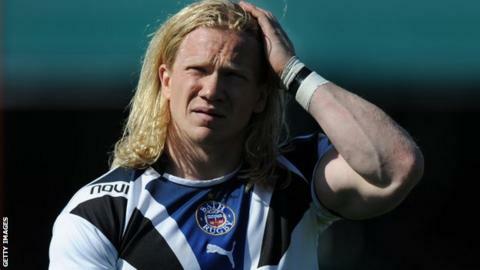 Worcester boss Dean Ryan has dismissed as "speculation" a report that the Warriors are to sign Bath and England Saxons winger Tom Biggs this summer. The Rugby Paper reported at the weekend that 29-year-old Biggs' intended switch to rugby league with Hull FC had stalled and that he will stay in rugby union with Worcester at Sixways. But Ryan told BBC Hereford & Worcester: "Speculation doesn't serve anybody. "I've said all season that players announcements come through the club." Biggs, who played for Leeds and Newcastle before joining Bath in 2010, has not figured in the Premiership for Bath since early October, just prior to reportedly signing a three-year contract with Hull, tying him to the KC Stadium until the end of 2016. Hull had even entertained hopes of having him in time for the start of the Super League season in February. It was then reported that Biggs' intended arrival would be delayed, to allow Bath cover during the six-week duration of this year's Six Nations. But Biggs made the last of this season's 11 Bath appearances at Leicester in the LV= Cup in late January - the night before the Six Nations began. BBC Radio Humberside reported last month that Biggs was now unlikely to be joining Hull FC this season. And now Ryan has declined the opportunity to confirm the report that he is instead going to sign up at Sixways. "I don't comment on what the Rugby Paper puts in," added the Worcester director of rugby. "We have a recruitment strategy here. We announce signings when we've got them and that will be the same going forward." Ryan has already made 12 Warriors signings for the 2014-15 season, a campaign which, despite looking relegation certainties all winter, could yet still be played out in the Premiership. Worcester's 17-12 win at Newcastle last Sunday has given them a lifeline, although Ryan's side will still need to win at least two of their final four matches to stand even a chance of surviving.